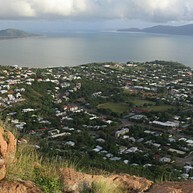 There is plenty to do and see around Townsville. The wreck of the SS Yongala just off the North Queensland coast, measuring more than 100 metres, has been labelled one of the world’s top-ten diving sites. Also, just 135 km to the southwest is Charters Towers, a living history site, which was established during the gold trade in the late 1800s. Today it contains a number of superb historic buildings. For families and nature lovers, there is Billabong Sanctuary with its wombats and koalas, as well as the Reef HQ on Flinders Street. Culture is catered to at the Aboriginal Centre and at the National Heritage Complex in the West End. 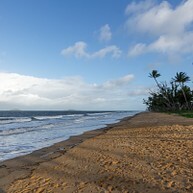 Escape to a tropical island, nearby Magnetic (or “Maggie” to locals). The island offers a wide range of activities for a perfect day off. 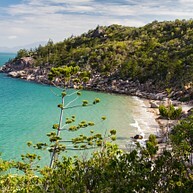 Hop on the ferry and spend the day swimming, sun bathing or simply relaxing at one of the many beautiful bays or beaches on Magnetic Island. 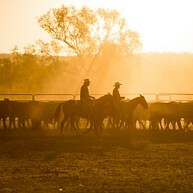 Experience a real Australian adventure on a working Queensland cattle station. Ride a friendly horse through the beautiful Australian bush and enjoy learning how to draft cattle, shear sheep and crack a whip. After a morning of hard work, you can tuck into an oven roast lunch. 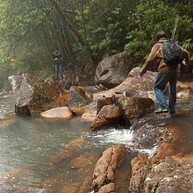 Just 17 km south of Townsville crocodiles, snakes, wombats, and koalas are in abundance. 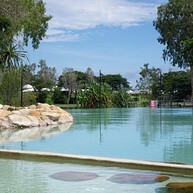 Billabong Sanctuary offers visitors a chance to experience crocodile and snake handling shows, wombat and koala petting and a dip in the resort-sized pool. Explore the diverse fauna and take a picture with these unique species. This is the largest living coral aquarium in the world - an example of the Great Barrier Reef on land. It has 100,000 visitors a year - so why not try a fantastic fishy adventure for the whole family? Book your tour guide in advance and have one unforgettable experience. This historical complex has three Queensland houses dating from the last 150 years. All are furnished in the fashion of the period when they were built. The collection of preserved materials from the past, as well as the annual Heritage festival, present to its visitors an interesting part of local history and culture. National Trust Heritage Centre is definitely a good place for a blast from the past. Just a 90 minute drive from the city, gold was discovered in 1871 by an Aboriginal boy named Jupiter. Today the town has 10,000 inhabitants and has some beautifully preserved 19th and early 20th century buildings from its heyday. It is well worth a visit. 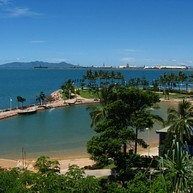 Townsville’s beachfront promenade is a 2.5 km stretch of parkland dotted with barbecues, picnic areas, exercise facilities and restaurants, offering fun for the whole family. The free water park delights adults and children alike. With its beautiful views the spot is also a great choice for a romantic stroll with your beloved one. Castle Hill is a popular tourist site which offers some of the best views over the city of Townsville. You can drive up there and park at the top. From there you can continue walking or cycling for an even more amazing view over the city and the surrounding area. Paluma and Crystal Creek Rainforest is a hidden gem and a lovely cooling spot where you can escape the hot summer days and indulge in tranquility. After the hike to the creek, take a cold swim, have a picnic, barbecue and just enjoy your day in these beautiful surroundings. 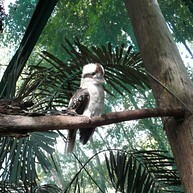 The Palmetum welcomes you to a serene and beautiful botanical garden in the middle of Townsville. Walk around these lovely surroundings and enjoy the tranquility and the variety of plants from different environments, such as rain forest, lagoon, desert and much more. Riverway is a great destination for culture, sports and other fun and leisure activities, well-visited among both locals and tourists. Come here with the whole family, swim in the lagoons, make yourself comfortable in the shaded spots and fire up a barbecue. 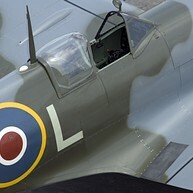 The Royal Australian Air Force Museum is located only 10 minutes from the heart of the city. Discover the military history of North Queensland from World War II until today. Take half a day to see the extensive exhibits. The entrance is free of charge. The Maritime Museum of Townsville is a museum which covers a considerable period of the town’s maritime history. It welcomes everyday people from all around the world, and it is a big attraction for everyone who is keen on human activity at sea. 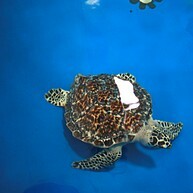 Visit the different galleries, explore the preserved materials and artefacts and have an exciting maritime experience.